Pray for the Elementary School ... for Principal Phillip Mwembo, the faculty, and the children. 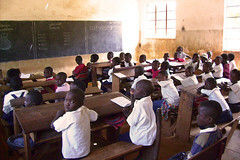 The Elementary School serves about 450 children from Mulungwishi station and the nearby villages. For many of these children, especially the girls, this is the only formal education they will ever get.